A Bible Festival program account is established to pay for the expenses of the programs, including honorariums, advertising, sound, lighting, travel and meals. These expenses amount to about 75% of the annual costs. If you would like to contribute to programs, simply designate Bible Festival or programs on the memo line of the check. Donations do not fully cover the costs of the programs. We also seek Sponsors. These gifts vary from $250.00 to $1000.00 depending on the size of the program. The sponsor will be recognized at the program, and a table is provided for displays. For sponsorship information, call Bob Kettering, president at 717-330-6774 or Dave Pierce, treasurer, at 717-371-1725. 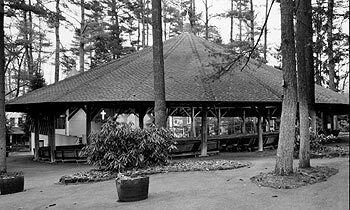 A Tabernacle trustee account maintains and preserves the property. Projects to repair and improve the facilities are ongoing. Built in 1899 by John Cilley, it is recognized in the National Registry of Historical Places. The trustee expenses average about 25% of the annual costs. To make contributions to this account, indicate Tabernacle Fund on the memo line of the check. One check can be written payable to the Bible Festival, which will be deposited into the proper accounts as indicated. For tax purposes, all donations for the entire year, if totaling $200.00 or more, will be acknowledged by letter in January of the following year. Donations of $100.00 or higher may be designated in memory or honor of someone. In addition, in 2017, the year of our 125th anniversary, we began an Endowment Fund for the preservation of capital. Donations to this fund are restricted. The capital will be retained and only the interest will be used for programming. Larger donations, wills, bequests, etc. can be designated for this Endowment Fund. Make all checks payable to the Bible Festival and mailed to Mt. Gretna Tabernacle Association, PO Box 408, Mt. Gretna, PA 17064. For questions, email office@MtGretnaTabernacle.org or call 717-371-1725.